While it's only about a 45-minute drive west of Austin, the 7,000-acre Horseshoe Bay Resort Marriott Hotel feels a world away. Located along the banks of Lake LBJ, the resort is tucked into the rolling Hill Country and it has a slow pace to match. The Marriott: The Horseshoe Bay Marriott has 385 hotel rooms and suites. The hotel houses the Lantana Bar & Grill in addition to a gift shop, tour desk, real estate desk, concierge, and kid’s program and childcare. The rooms are luxurious and spotless but are decorated in a homey way that makes you feel at ease. They all have floor-to-ceiling windows, many of which feature a spectacular view of the resort. 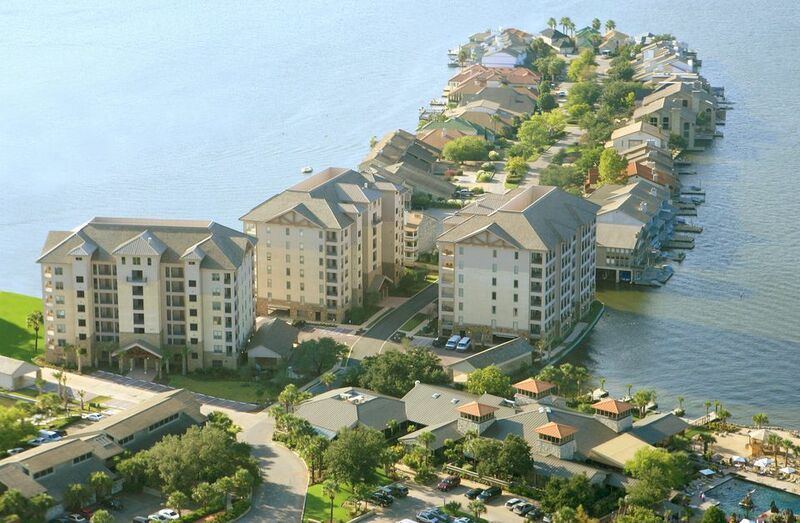 The Waters at Horseshoe Bay: The Waters are a series of individually owned luxury condominiums that can be rented by resort guests, as most of the owners do not live at the resort full-time if at all. The one- to three-bedroom condos are all single level, professionally decorated with fully stocked kitchen appliances and gadgets, and have large, fully furnished balconies. They are a short drive (or long walk) from the hotel and the other amenities in that area. They also feature high-definition flat screen televisions, washers and dryers, and docking stations. Paseo Vacation Apartments: Adjacent to the hotel are the Paseo villas, which are rentable condos that range from one bedroom to three bedrooms. They feature wet bars, full kitchens, and separate living areas, and are popular with families who need more space. Because there is very little dining in the town of Horseshoe Bay itself, the resort has numerous drinking and dining facilities for its guests and residents. During the summer months, the Yacht Club Grill and the Yacht Club Pool Bar are open for casual lakeside dining and drinking. The sophisticated Yacht Club is the resort’s anchor restaurant and has been around for more than 30 years. The Y Bar and the Bar at Whitewater are two fun places to grab drinks at night. The Cap Rock Bar & Grill offers upscale lunch and dinner and the Slick Rock Bar & Grill has slightly more casual ambiance. The Lantana Bar & Grill is the restaurant in the Marriott. Anyone can eat at the Lantana, but you must be an overnight resort guest or club member to dine at any of the other facilities. The Cap Rock Grill is another fine restaurant at the resort, which has an open kitchen and beautiful vistas from a two-level deck. If you like to golf, you will be in heaven at Horseshoe Bay. Golf Magazine named Horseshoe Bay one of the best golf resorts in America for to its three 18-hole championship golf courses, Slick Rock, Ram Rock, and Apple Rock, designed by Robert Trent Jones, Sr. Ram Rock is known as one of the most difficult golf courses in Texas, while Slick Rock is much easier. You can find golf gear and attire at the Cap Rock and Slick Rock Pro Shops. Just a short walk from the hotel is Whitewater, a beautiful and tropical-themed 18-hole putting course that is par 72. It is made of real Bermuda grass and has waterfalls along the way. If you’re lucky, you will spot some flamingos. The grounds around the resort are beautifully sculpted with plenty of amenities to keep both residents and guests busy. Next to the pool is a gorgeous hot tub, which is large enough to fit 27 people. The tall rocks throughout it look like petrified wood and some have bronze life-size statues perched above them. Nearby is a small and popular white sand beach alongside the lake. Adults can lounge on the beach chairs and kids can play at Turtle Beach, a child-friendly wading area. Around the corner is the activity lawn, a large rectangle of lush grass used for planned programs for children throughout the year. The Bayside Fitness Center features every type of equipment you would need, with televisions on every treadmill. Horseshoe Bay also features 16 tennis courts, including the first tennis courts in the country to be specifically designed for children up to age 10. The resort also has a large marina where you can rent Waverunners, Cobalt boats, and a variety of other high-end boats and watercraft. The resort’s Bayside Spa offers guests a resistance pool, steam rooms, and dry saunas, as well as a variety of spa treatments, such as massages and manicures. One of the resort's most unique amenities is the Horseshoe Bay Resort Airport and Jet Center. It has a terminal building with a luxury passenger lounge in addition to a 6,000-foot lighted runway, which is one of the largest private airstrips in Texas. There are some private homes near the airport that have their own hangars, which look like giant garages attached to the house. If you don’t have your own private jet to fly in on, you can fly Air Horseshoe, which is a charter jet service.